The group also has branches in Benghazi and Libya. Officials said the State Department is expected to designate all three branches as foreign terrorist organizations in coming days.Themove allows the United States to freeze assets, impose travel bans on their members and affiliates, and prohibit Americans from offering material support. Qumu apparently has a long history with al Qaeda. He was a central figure at an Osama bin Laden terror training camp in Afghanistan in the 1990s before moving to Sudan to work as a driver for one of bin Laden's companies. He fought alongside the Taliban battling American forces after the 2001 invasion of Afghanistan, before being picked up in Pakistan and sent to Guantanamo. He was released to Libyan custody in 2007 and in 2008 was set free by Libyan authorities. In an interview with a local media outlet in 2012, Qumu made clear that the time he spent in U.S. custody left him embittered toward the United States. But he denied he was a supporter of violence. Libyan sources have told CNN in late 2012 that the investigation indicated the perpetrators of the attack came from beyond the Benghazi area, possibly Derna, and slipped away immediately after the assault. American officials confirmed that witnesses place men under Qumu's command before the Benghazi attack, but it's unclear if they were part of a planned assault. The Obama administration maintains that intelligence suggests the siege was an opportunistic attack that did not involve significant planning. Darnah is several hours drive from Benghazi. The State Department also plans to identify Qumu and two militia leaders as "specially designated global terrorists," which offers the United States other tools to freeze their financial assets and bar American citizens and companies from doing business with them. According to the officials, the two individuals are Ahmed Abu Khattala and Seif Allah bin Hassine. Kattala was one of several suspects named in an August federal criminal complaint in the attack. Khattala, a prominent member of Ansar al-Sharia in Benghazi , had openly operated in Benghazi for months, flaunting U.S. authorities who have been unable to investigate the attack or question any suspects because of the lawless security situation in Eastern Libya. In October, U.S. officials scrapped a plan to capture Khattala in Benghazi for fear that such a move could trigger unrest and cause the collapse of the Libyan government. In an interview last year with CNN's Arwa Damon, Kattalah acknowledged being at the U.S. compound in Benghazi during the attack, but denied being involved in the violence. The United States has said Tunisia branch of Ansar al-Sharia was responsible for the Benghazi attack and another against an American school in Tunis. It also has been implicated in attacks against Tunisia security forces, assassinations of Tunisian political figures and attempted suicide bombings of tourist locations. – CNN Terrorism Analyst Paul Cruickshank contributed to this story. We need to go back to killing people in this country . We are too nice to our prisoners and our criminals. Obama was briefed on the attack. Hillary and Obama pushed false narrative. Should have "removed the problem" the North Korean way – fed them to the dogs at Guantanamo. Problem solved. The Gitmo detention facility has been a more powerful recruitment tool for all muslim extremist groups than anything they could have come up with themselves. It should have been closed in February 2009. It was the 1st of many broken promises. Good posting, Navyvet8192. Thank you. 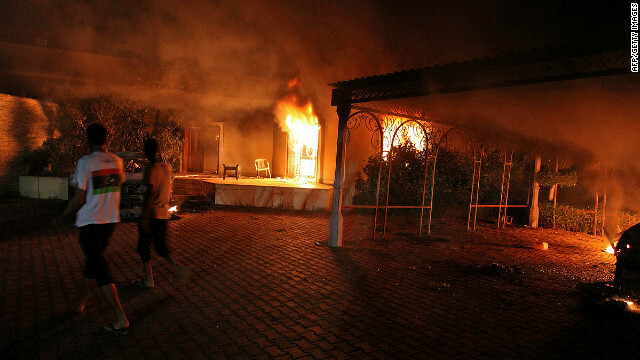 In her remarks the very day after the attack on the Benghazi outpost, Secretary Clinton told the American people that, "Heavily armed militants assaulted the compound and set fire to our buildings." Just what difference does it make whether these people were knocked off by Al Qaeda or some home grown Libyan extremists? These people are equally dead either way! If we had any sense, we'd close all of our diplomatic posts there all remove all of our diplomats from that country until things stabilize there! I guess that we'll never know for sure whether this former Gitmo detainee is guilty or not since they need a scapegoat for these attacks! Is this allegation against Sufian bin Qumu by the State Dept. true or is this another piece of right-wing propaganda for us to keep Gitmo open indefinitely? The right-wing politicians in Washington lied to us so many times that we can no longer believe a single word they say!!! Gee Peter, what a dumb comment this is. None of us even knows whether this guy in question even has anything to do with those attacks on the Americans last year. Whatever happened to "innocent until proven guilty"? The photographs pretty much prove his involvement, don't you think? That's certainly enough information for me to declare him guilty. So he was released in 2007, that would be during the Bush administration. I am surprised that no one is pointing out that the Bush administration released a known terrorist. I wonder if the same silence would be occurring if the Obama administration has released him? Somehow I doubt that! Of course it would released inmates under Obama would not of even been in a story on CNN........get a clue. what do you think? yeah, me too. LESSON? Do not release GITMO detainees as they are not human. GITMO did not make them evil they were that way long before they were incarcerated. You are not a Saudi Arabian or Egyptian vacationing on the battle field in Afghanistan with an AK or RPG you are vermin, treat them as such What gets us in trouble is after we waterboard the vermin and get whatever limited information we can we let them live versus hang them and then feed their carcasses to hogs and give a pile of hog manure to the family for burial at a cost for all shipping from them up front. Where is the "like" button? Well said. Moral of the story: Never release Gitmo terrorists, put them to death if you have to, but never release them. They are there for a reason. Terrorists hate Gitmo. Good people like Gitmo. Just stop catering to those terrorists. Give them standard American prison food. Thank you, Brad. Posted like another hateful, feeble minded Tea Partier. Did it ever occur to you that most of those men are innocent? Evidently not!!! No, the root of all evil in the WORLD is liberalism/socialism and Marxism. A conservative would of exterminated the middle east long ago and simply given their oil to Europe on the bones of dead fanatical hateful muslims. Another hateful comment from another dimwitted Tea Partier. The conservatives(right-wing fanatics in both Washington and London) are causing 95% of all the problems in the world today. Who invaded Iraq back in 2003 and who are using those ungodly drones in both Afghanistan and Pakistan nowadays? The defense rests!!! The Russians shot down a civilian aircraft that went off course. I don't know the number or the date. About US companies sending arms to Iraq to fight Iran and you are complaining? Countries that manufacture military hardware do it all the time. Doesn't Iran send rockets to Hezballah or Syria ? Stop calling the kettle black. Since you are pro Iranian I can only believe it is okay for crazy Iran to have a Nuke? Closing Gitmo sounds like the best plan. Release them all. They are just poor innocent people. Release them all at sea offshore a couple hundred miles without a life vest sounds great. You really are a piece of work, if you blame this guy for hating the United States. He did nothing wrong, yet we stole decades from his life. No compensation for the years in jail. He was not allowed to see his family. Even when we admitted he did nothing, we still kept him locked up for years. If some country did that to me, I would hate them. If there is one thing that can keep you going, it is a desire for vengeance. So... if some country imprisoned me for that long, I would want that country to to suffer. Would I try to attack them? Only if I thought I could hurt them a lot. "He was a central figure at an Osama bin Laden terror training camp in Afghanistan in the 1990s before moving to Sudan to work as a driver for one of bin Laden's companies. He fought alongside the Taliban battling American forces after the 2001 invasion of Afghanistan, before being picked up in Pakistan and sent to Guantanamo." Well, I guess this puts the lie to that New York Times story from a week or so ago. But don't expect a apology or acknowledgement that their story was their usual BS in support of one or another Liberal politician. WAIIIIIIt.....Innocent people are in Guantanamo but Osama driver gets released by US government...to start new version of Al-CIAda. So US government is behind terrorism. And what happened with NY Times claim attack has nothing to do with Al-CIAda??? Who is lying NY Times or US government??? Now ask yourself... who was president in 2007? And you know there are probably other versions in works too in case this one doesn't go over. Seems someone keeps changing the story everyday so that Hillary and Michelle will get elected. Quite true Different story everyday, quite true indeed!